Simple Equipment: Open space, a ball (volleyball), field markers (8-16 cones), and two teams of players (2 or more). Things included in the game: Contacting the ball with any body part, bouncing the ball, kicking/spiking/lobbing the ball to score, contact with opposing players, equal rules for each player, horizontal goals. Things NOT in the game: Conventional goal frames/net, goalkeepers, picking the ball up, holding/carrying/throwing the ball, open-hand sets and spikes, rolling/dribbling the ball on the ground, sidelines, offsides. Nashball is a fast-paced and athletic, newly invented sport inspired by the simplicity and free flow of soccer / football and incorporating ball handling of fistball and volleyball. Nashball shares with basketball the concept of bouncing the ball once between many contacts (one bounce only is a rule in Nashball, in fact.) As with many open-field team sports, new and old, it uses a ball and allows contact with the entire body, providing a wide range of creativity and skill. The rules are simple and require only a ball and eight field markers per side. Marking the oval with a rope is a good option, as well. In addition to minimal equipment and setup, Nashball accommodates players of a wide range of size and athletic backgrounds. Field sports with a ball using the entire body (arms but no hands) date back as far as the year 600 with the Japanese sport, kemari. The idea of using no open hands but only fists was mentioned in Rome around the year 240 with the first rules of Italian fistball being written in 1555 by Antonius Scaiono. (Wikipedia). Volleyball is the first modern game allowing contact with the entire body but prohibiting holding and throwing the ball. Volleyball has also been played incorporating team handball or futsal goals, without a net, and by mixing volleyball touches into futsal/soccer. Speedball essentially incorporates use of feet into team handball. 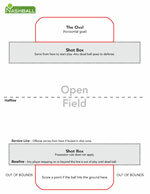 Nashball uses many of these elements but with its own unique concepts like a four touches per person, no sidelines, and scoring with a ground hit in a horizontal goal rather than conventional vertical-frame goal. Nashball can be described in very simple terms as hand soccer, a mix between soccer and fistball, or as a hybrid of football and volleyball. As in rugby, team handball, ultimate, basketball, lacrosse, tchoukball, etc. it is a free-flowing, open-field sport. Like Gaelic football, Australian rules football, beach volleyball, and newer sports like speedball and kronum, the entire body is used to contact the ball. Open-hand control of the ball (holding, picking up, or carrying the ball) is restricted as with soccer, volleyball, fistball, and circle rules football. This lack of ball-carrying removes the element of tackling as used in the majority of football / rugby codes, allowing the game to flow continuously from player-to-player, team-to-team, with possession changing often. In Nashball, the ball is allowed to bounce only once rather than be rolled or dribbled as in soccer or Gaelic football. As a result, a ball in play feels very live and the intensity grows the longer the balls remains active, much like tennis. Finally, the lack of a net or raised basket combined with no tackling allows more equal play for participants of any size – one of the reasons football / soccer is so prominent worldwide. Nashball works well with a variety of player numbers. Large games of eight or more per side require a field 70-100 yards long and involve field positions much like soccer. Games also work well with 3-5 players a side, a 50-60 yard field.The 2 vs. 2 version of Nashball is best played with a field closer in size to a volleyball court. This game adds the rule that that a player of the same team must receive a serve first before the defense can touch the ball. Points in Nashball 2 on 2 are quick and skillful. This version is a sort of contact volleyball match with no net. There are alternative versions of Nashball, as well. The beach version of Nashball requires more volleyball skill as the ball rarely bounces. Beach Nashball adds the rule of being allowed to scoop the ball up from the sand with one hand (or foot) as long as the player (a different player from the same team who touched it last ) approaches the ball and releases it in one fluid motion, either to himself or another player. This scooped pass cannot bounce twice (or roll) without another player touching it or it is a turnover. Indoor Nashball played in a gymnasium allows the ball to bounce off walls. Only bounces on the floor are considered in the “one bounce” rule. Balls beyond the baseline are out-of-bounds, as in the outdoor game. This includes the back wall. Indoor Nashball is much quicker, therefore a smaller field can include more players than the outdoor game. While all of these sports are the inspiration for Nashball, it isn’t an exact hybrid of any specific sports. Specifically Nashball does not include goals, baskets, or a net. There is no holding, throwing, carrying, picking up, dribbling or rolling the ball on the ground. Open-hand volleyball sets and spikes are not allowed. No one is allowed to step in the end zone (the oval). There are no sidelines. With a simple combination of basic concepts, Nashball has its own feel and unique set of rules. See rules page or download them here.